Many dieters and nutrition-savvy people turn to rice cakes as a healthy snack choice, often covering them with low-fat cream cheese, peanut butter or some other healthy topping. 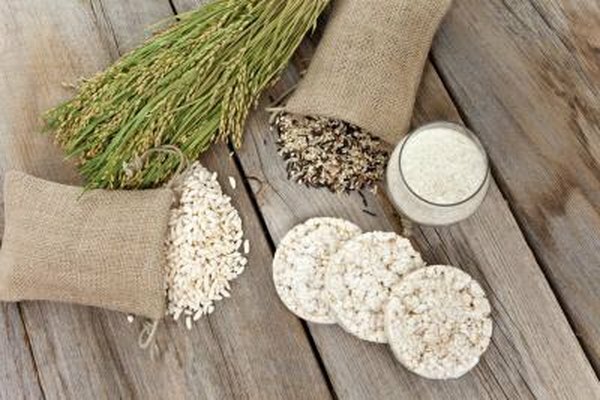 Rice cakes consist of puffed rice grains, which food companies compress into disc shapes. And while these light, airy snacks may be beneficial for people trying to lose weight, rice cakes do not have a high nutritional value. The amount of calories you consume daily has a significant impact on whether you gain, lose or maintain body weight. Calories are the body’s fuels, which you acquire from carbohydrates, proteins and fats. According to the Nutrition Facts label, one plain rice cake contains 35 calories. Considering that the average person should consume approximately 2,000 calories each day, rice cakes are a low-energy food. Of the three calorie-providing nutrients, the body can use carbohydrates most efficiently for generating energy. One plain rice cake contains 7 grams of carbohydrates, which represents just 2 percent of the recommended daily value. Rice cakes have 1 gram of protein, making them a poor snack choice for bodybuilders and athletes looking to build strength. That 1 gram translates to just 2 percent of the 46 grams of protein women need each day. Proteins provide the body with amino acids, which are the building blocks of muscle fibers. Rice cakes have 0.4 gram of total fat. This lack of fat can be beneficial for people trying to lose weight, because fat provides 9 calories per gram, while carbohydrates and proteins only offer 4 calories. However, some fats — specifically the unsaturated varieties — can offer nutritional benefits, such as lowering levels of LDL, or bad cholesterol, in the blood. For this reason, the lack of fat in rice cakes can be a nutritional drawback. Some varieties of rice cakes only offer one vitamin in sufficient quantities: niacin. Like all vitamins in the B-complex, niacin helps the body convert food into energy. More specifically, as Colorado State University notes, niacin aids in the digestive process, encourages a healthy appetite and promotes healthy skin and nerves. Rice cakes offer several minerals, including potassium, magnesium, zinc and copper, all of which represent 1 percent of their individual recommended daily values. The mineral phosphorus, however, appears in rice cakes with amounts comprising 2 percent of the daily value. Phosphorus works in combination with calcium to form and maintain teeth, bones and nerve cells. According to the Thagard Student Health Center, rice cakes and other popular, processed fat-free snack items tend to rank high on the glycemic index. This means that the body can digest rice cakes and absorb their carbohydrates easily, which causes insulin and blood-sugar levels to rise rapidly. These rapid rises that occur as a result of consuming high-glycemic index foods can lead to, and impact, a variety of health problems, including diabetes.